In her post Sue calls the striped background "an interesting and unusual choice." It seems to me that the stripe differentiates this quilt from all the other applique quilts that are out there. Let's face it, there are a lot of similar quilts in the world. 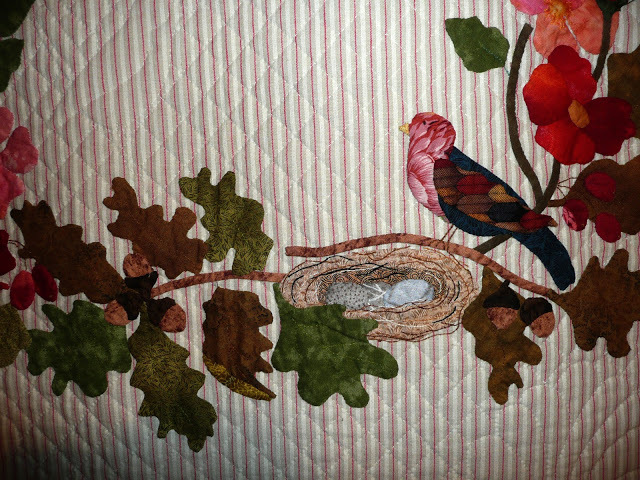 It seems to me that something that will make the viewer look twice, and maybe think about the quilt or discuss the quilt a little more, is a good thing. So as far as my little hexagon quilt goes, the stripes may not be the safe choice, but maybe they will be a more interesting one! Thanks again to Sue for the great photos. There's a lot to like about this, isn't there? The shapes and colours are lovely and the quilting lines look as if they create another dimension. I agree again! A lot of those fabrics in the second photo wouldn't be the obvious first choice for leaves, but they look great when they're all put together. Thank you for commenting on my Flower Fairies CQJP. I looked at your post on the backgrounds for the hexagons, and I completely agree that the stripe is much better, more interesting!